May | 2015 | Small Farmers. Big Change. 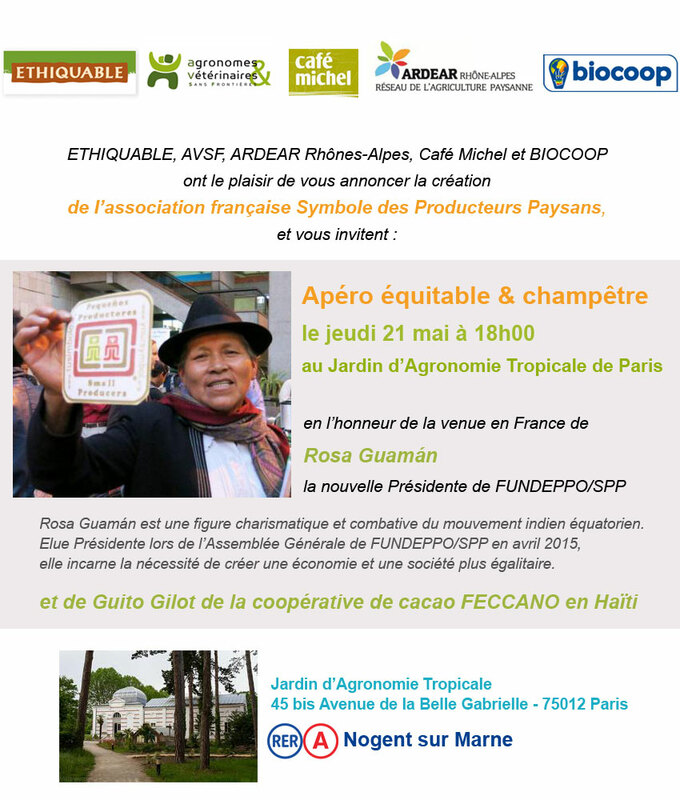 Our French Allies Take New Actions to Support Authentic Fair Trade! Ethiquable, an Alternative Trade Organization in France (that is also a co-operative) was one of the earliest supporters of the Small Producers Symbol (SPP). Like Equal Exchange, Ethiquable recognizes the tremendous importance of this new Fair Trade system that is so-much-more than a certification system. The first of its kind, the SPP was created, and is entirely owned, by small-scale producers. Their goal is to build bridges with alternative trade organizations, engaged, committed “consumers”, civic organizations, and other allies to create an authentic trade movement that promotes democratically-run organizations, sustainable agriculture, and high quality, healthy food. By creating SPP France, we – Southern producers & French actors: civil society, citizens, consumers, engaged businesses – are driven by one conviction: the strength of the fair trade proposal is based on organized peasant agriculture. This agriculture is the engine of sustainable and inclusive development; we need to support it because it is the only way to guarantee a future for everyone, healthy, high quality, and environmentally sustainable food. However, we note that after several decades of existence and profound changes – especially in the 2000s, fair trade is no longer solely focused on this same vision. In reality, there is now multiple visions and the Fair Trade movement displays a variety of practices that we believe dilute the strength of the original design and especially its ability to offer an alternative – of deep impact – to conventional trade. Industry players no longer put all the focus on the goals of changing power relations within the agricultural sector or on the intrinsic link between fair trade and organized farming. By not putting more priority support on small-scale agriculture that it was proposed to support from its creation, fair trade is in danger of being emptied of its substance. Because it met commercial initiatives at variable requirements – for different certification standards and the concept of fair trade is about to approach a kind of lowest common denominator reducing the guarantee level as much for producers as for consumers. Without denying the relevance of other forms of “sustainable trade” which is now growing, we affirm that fair trade should remain the initiative that builds on the highest level of standards. Our reading of the issues of fair trade leads us to reaffirm the fundamental values ​​and revive the pioneering spirit of the movement. By providing a clear guarantee respecting the original principles of fair trade, the Small Farmers Symbol (SPP) meets this challenge. SPP is in fact the first guarantee system of fair trade internationally with the requirement that it belong to organized producers. The SPP was established as an initiative, not of Northern actors but of the CLAC, the Federation of Latin American producers of fair trade. The Small Farmer Symbol brings together producer organizations, which beyond a commercial aspect, share a common vision of development of rural areas, defense of a diversified and responsible agricultural production of small-scale farming families and the environment, and a willingness to defend the interests of small producers against other players (state, communities, businesses …). Together they offer a rigorous and independent guarantee of fair trade system designed as a support tool for development, as a lever for change of peasant communities. The SPP therefore has chosen a fair trade model centered on small producers, their families and their organizations. It also wants to give new meaning to the concept of a guaranteed minimum price, with higher levels than current standards. It also revives the principles of independence and empowerment of producer organizations. It aims to provide direct market access for cooperatives by facilitating their ability to directly export in partnership with committed companies. The SPP also intends to expand local markets in producing countries, facilitating its use by cooperatives on their own finished end products. Why create an association SPP France? To facilitate the access of small producers organizations to markets. What are its main tasks?